2007 Toyoyta Matrix driving on Chicago city street. The Front End sheild falls off while driving and is not under Warranty per dealer and Toyota complaint department. I wish my wife had listened to me whem I told her not to buy this car. The car has never been in an accident. The dealer even told my wife he would not release the vehicle we own back to her. 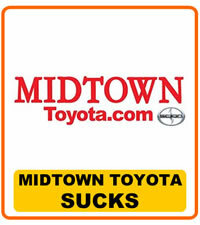 Midtown Toyota in Chicago part of a large Auto sales conglomerate , they sell everything on wheels and appear to honor nothing. Toyota vehicles are overpriced and the reason they stack up so well on the auot review sites is beacause they do not honor the auto warranties and they never have recalls because they won't release the information. Sorry we bought the car. Going to take this a step or 2 further.